From the plane of Moag. In the Wiki entry it was noted that the Phyrexians attacked the plane, this comes from that storyline. When Sickly Nymph does what? Either ETB or dies, I assume. This one's from Kolbahan, and I matched the ability with the Plane card. I know it's a traditionally green ability, but I think it works really flavorfully well and makes a lot of sense. When ~ enters the battlefield, create a 0/3 green Plant creature token. , Sacrifice a Plant: Put a +1/+1 counter on target creature. Scry 2. Judging this in 24 hours. Alright, it's been more than 24 hours now, so let's get to getting. Jartis (Kephalai Prelate): A board-wide lock like this is too strong at common, and maybe even at uncommon. While the theme of Kephalai's totalitarian bureacracy is well-represented, the power level of this card makes this a hard sell for me. Yoshi (Fomori Ritualist): Simple and efficient, it rewards you for going big with your spells. Even just casting a vanilla fatty nets you a tidy 3 mana, allowing you to chain into another 5+ CMC spell. viriss (Regathan Wurm): This guy hints at Desert matters in Regatha. Interesting. Depending on the Deserts in Limited, it could either be super-situational or really strong, being able to attack and then untap to defend (though that 3 toughness makes it a bit risky). gluestick248 (Ruthless Raider): Another simple and clean signpost. Feels like it could do with some flavor text. Tesagk (Sickly Nymph): Tainted is a drawback keyword, something WOTC stays away from these days-- and for good reason: opening a pack and seeing this is not going to make a favorable first impression. As for the card itself, it's a Generous Stray with the potential to draw a second card, though that really depends on the enablers you're gonna print for this. If you want to make "Tainted" work, I'd give it a way to get the counter off without additional cards or do effects like Shed Weakness at common. 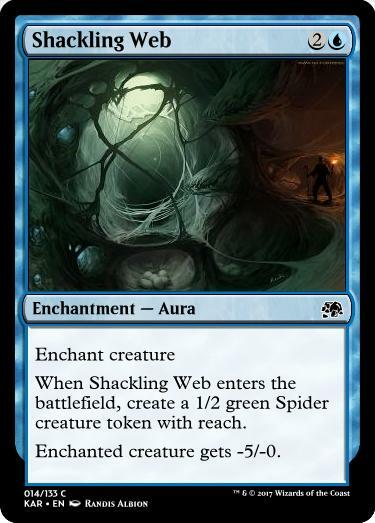 Daij_Djan (Shackling Web): The card is a perfectly serviceable common, and points towards a possible archetype. It doesn't feel very Karsus though: the flavor of this card is pretty generic. 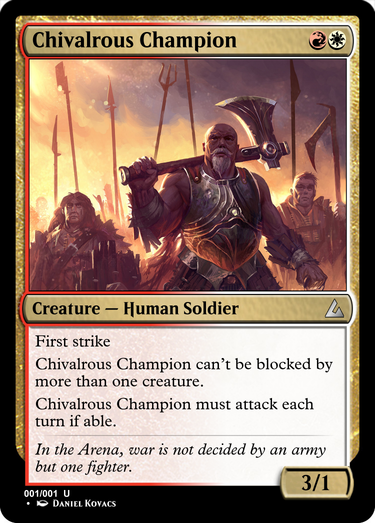 gateways7 (Chivalrous Champion): The flavor of this card matches up with the mechanics like a tee, which is great. Its 1 toughness also renders it vulnerable to outside interference-- again, perfect matchup of fluff and crunch. This one was a pretty close contest, to be honest. I could see at least 3 candidates for the winner just from reading the posts. Runner-ups include gluestick248 with Ruthless Raider and Yoshi with Fomori Ritualist, both of which were flavorful and exciting. The winner is gateways7 with Chivalrous Champion, a perfect blend of flavor and mechanics that gives a sense of what the plane of Kolbahan is all about. @Icarael: Glad you liked my card even if the flavor was too generic (which I won't argue against ). Thanks so much Icarael! This challenge was a lot of fun. Let's have some more fun, shall we? For your next challenge, create a silver-bordered common or uncommon card with a mechanic that would work in an Un-Set. Good luck! Gah! I hate un-cards. >.> I'll have to try and keep an eye out for the next challenge, good luck folks. Whenever you roll a six-sided die, on a result of 6, Exploding Dice deals 1 damage to you. Roll the die again and add the new result to the total. • Search target player’s library for a creature card and put it into your graveyard. Then shuffle that library. Just remembered about this, so the challenge is closing in 24 hours. Common Courier can’t be blocked except by common creatures. I don't have much time for a full judging, so I'm going to give the win to monger with runner-ups Jartis and gluestick248. Thanks for participating! Next challenge: Design a noncreature card with converted mana cost four or greater (which, as always, must be a common or uncommon). If the amount of mana spent on X was less than the creature’s converted mana cost, the creature gets a number of -1/-1 counters equal to its converted mana cost - X.
I realize it's weaker than Mind Control, but we haven't seen a card with a similar effect at uncommon, that cheap, and without drawback since 2012. I figure with the cost and potential drawback, this slots in at uncommon nicely. If nothing else, it could act as a 4 mana "kill target creature" in blue, which is unusual. All creatures enter the battlefield with a -1/-1 counter on them. Not even the employees are safe. Non-creature card or anti-creature card? EDIT: I changed the card to affect all creatures with one -1/-1 counter and have it cost two phyrexian black and 2 colorless. I had proliferate in mind when I made it, and I thought, it's a bit too good with two -1/-1 counters on enemy creatures, but it'd be too weak for one -1/-1 on all creatures. noncreature (cannot have the type "creature"). Also I'll leave this open for around 56 hours, even though that's past the normal deadline, since there are fewer entries. Might as well stick with the unofficial -1/-1 counter theme. Put four -1/-1 counters on target creature. Deal 5 damage to up to 3 target creatures, if a creature dealt damage by ~ dies this turn, exile it instead. The modern points of comparison here are Lay Claim and In Bolas’s Clutches, compared to which Hypnotism is pretty bad at gaining control of things. The “drawback” for mind control effects is typically the expensive cost. To get actual control value out of this you need to spend as much or more mana as the two aforementioned- and four blue to boot (note that only two other uncommons have had four colored mana on their cost, and one had an alternate cost (phthis and geosurge)). Also it acting as a 4mana “put X -1/-1 counters on target creatures where X is it’s cmc” is a pretty big pie break (straight removal, even if conditional). I like the idea of the Chamber’s effect, but the cost may be a little low considering the phyrexian mana. As a symmetrical effect it’s well balanced, but it’s also possible to break the synergy and turn off a lot of opponent’s creatures in the right matchup. Maybe 3(P/B)(P/B) (or change up the phyrexian to 3B)? Since it only effects creatures on ETB coming down on T3 versus T2 makes it easier for creatures to stick. Crippling Decay would be pretty mediocre at common. For five mana black can typically get straight removal with upside (ex Deadly Visit). While -1/-1 counters do have some upside to Flatten/Throttle effects, it’s not enough upside to warrant the speed downgrade and rarity upgrade. Illusionary Flames is basically a free three-for-one which is an immediate big red flag. It’s also castable in blue for some reason- big color pie break. There’s also two random upsides in “up to three target creatures” and the exile replacement effect. The counter downside is sort of a downside, making it harder to use lategame, but as soon as your opponent taps out you gain a massive momentum/advantage swing. I like Merciless Assassination as common removal. Funnily enough, GRN would be a good place for this card- 2 assassins at common, 1 at uncommon, and 2 at rare. 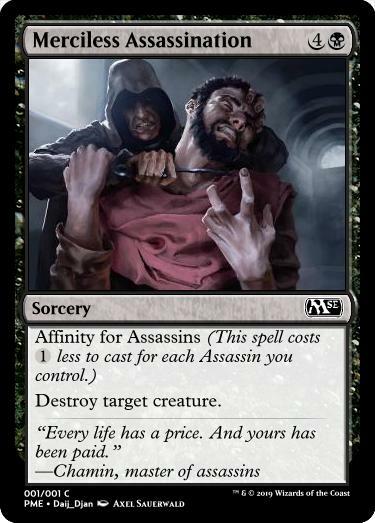 It’s a little awkward that it’s more balanced when there are fewer assassins in the set, but hard to get advantage out of if there are none at common. If this were in a true tribal set 3BB would be a safer cost. Draw Out is a little hard to evaluate but I think it’s overcosted. The most common casting case for limited will probably be X=2, maybe X=3 which gets the removal of a small creature and a 2-3 point drain, which is probably not worth a card. At XWB the same cost would get you a medium-large creature and a 4-5 point drain while being more flexible (XWBB could also work). I really like the combination of effects, especially with the orzhov flavor. The runnerups are melono and Tesagk.